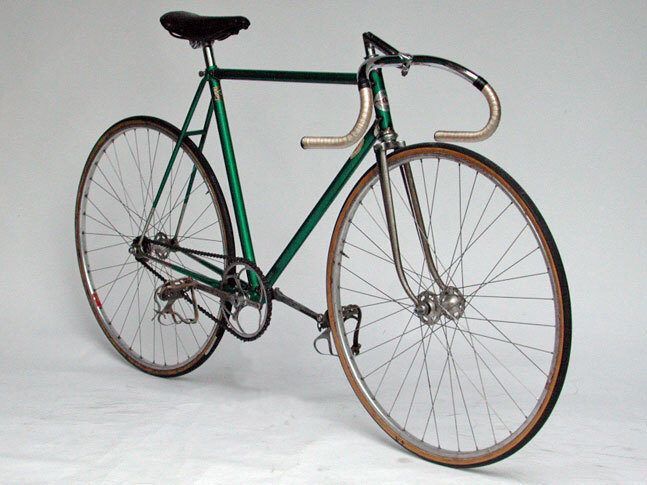 Cilo bicycles were produced in the Vaud canton on the shores of Lake Geneva in Romanel- sur Lausanne .”Cilo” is an acronym the founder Charles Jan Lausanne-Oron. The abbreviation of the name from the manufacturer “Jan” was transformed in “i” for pronunciation purpose in French. “Lausanne-Oron” refers to a holding in Lausanne, associated to the industrialization of the city at the turn of the 20th century (information from Wikipedia). Hans Knecht was world champion in 1946 riding a Cilo bicycle; other notable riders include Beat Breu, Daniel Gisiger and Tony Rominger (information from Wikipedia). 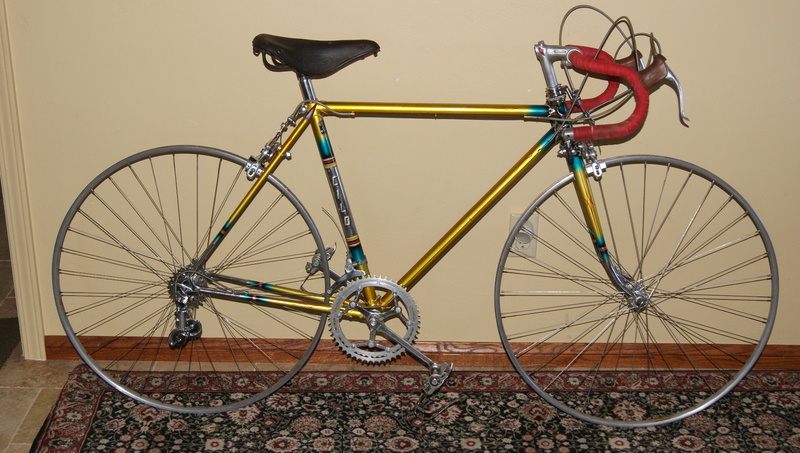 This Cilo is from the early to mid 1950s showing some classic detailing on the frame. The Nervex bottom bracket is nicely pin stripped and the chainstay bridge shows an extra bit of effort to make this frame a fancy one. 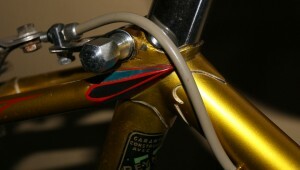 Note the cable guide braze ons. 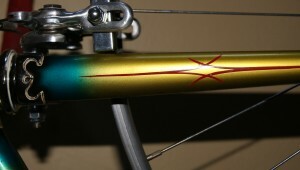 Durax Crank set. 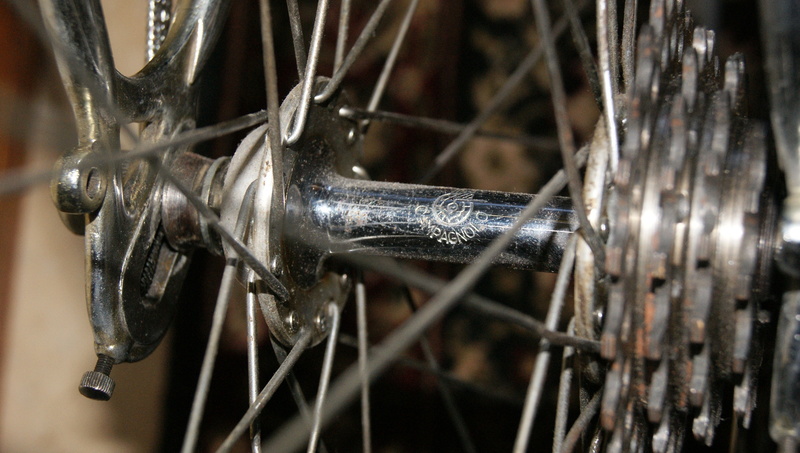 Many bicycle manufacturers provided special detail work into lugs and seat stay caps to identify their bikes from others as a matter of pride of work. In the typical swiss tradition of the time, color, pin stripping and fade paint and classic graphics were hallmarks of a tradition that started back in the 1920-30s. 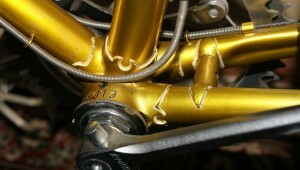 Note the seat bolt that was common on many Swiss bikes of the time. This frame is made with Campagnolo dropouts typical of fine frames of the time. 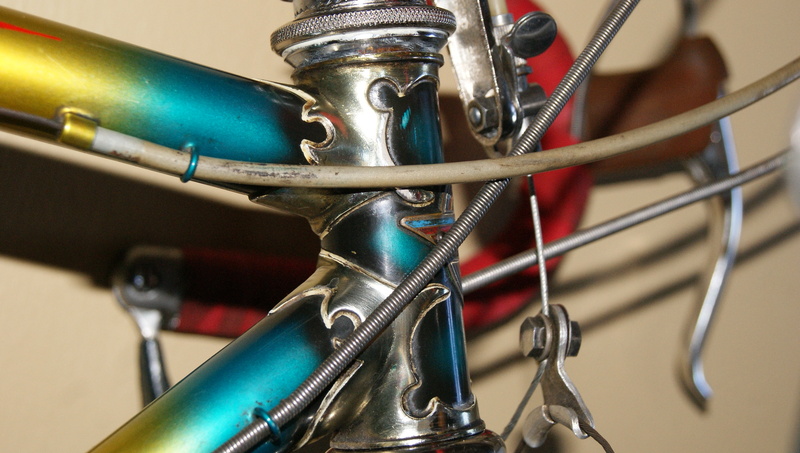 Note that this rear dropout has an early open C stampinjg in the word Campagnolo and a deraileur spring hole denoting an early frame manufacture. 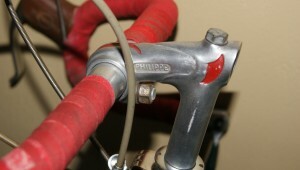 The cable adjustment bolt also is an Open C type early Campagnolo deraileur. The open C would be stamped on the back side of the deraileur. Nice detail is noted where the seat and chain stays meet the rear dropout. Fade paint and pin stripping were often in surprising color combinations that were appealing and stood out. 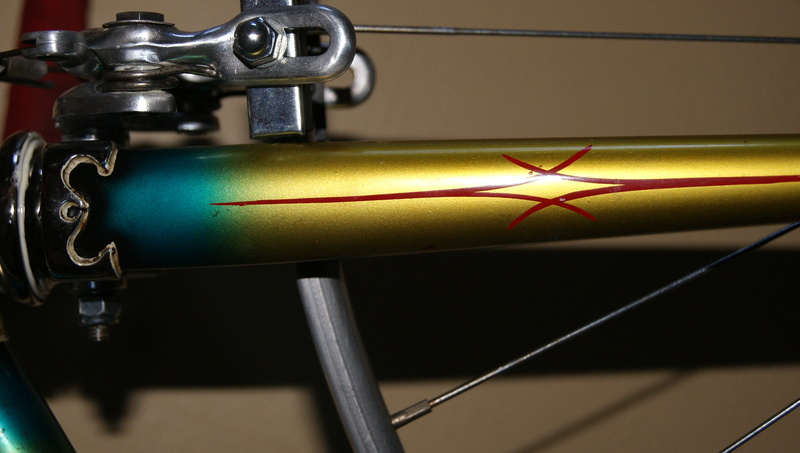 Note that the fork is lined in white, then black fades to blue and then to the main color of gold. The transition from blue to gold creates an almost green tint. Finally topped of with graceful red pin stripping for a nice touch. 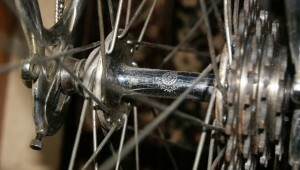 Early 3 piece Campagnolo hubset grace this frame, note the spoked and winged Campagnolo logo in the center of the hub. These hubs came with Open C quick releases. 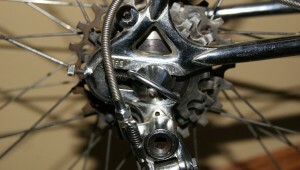 Typical hubs of this time were Campagnolo, Pellisier, FB, Simplex, Edco and Excellto. Philippe Handlebars, commonly Philippe Professional stamped on the top of the bars or the Philippe stamped on the end of the bar where the campagnolo end shifters would mount were very common on Swiss bikes at this time. Philippe Stems with the red paint detail of an arrow on the top of the stem are most often seen though Pivo was another manufacture of choice..
Weinmann provided many components for the Swiss bike industry. Shown here are the top of the line Weinmann 999 center pull brakes. Several models of 999 can be found. A one piece spring, a two piece spring, both with the word Weinmann stamped into the caliper arm. Also a less common silk screened version in red letters on the caliper can be found. 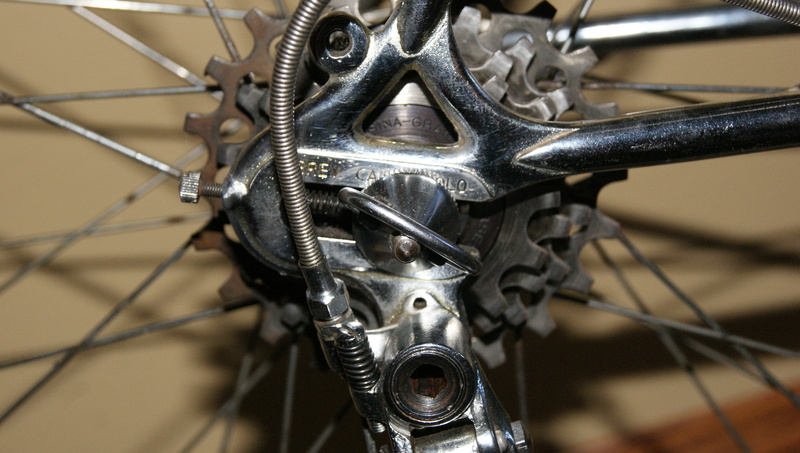 Note the graceful straddle wire yoke of this brake set. Weinmann brakes were considered one of the very best during this time. When properly adjusted they were firm, smooth with excellent stopping power for their day. This brake set should have the easily identifying red brake pads with 7 bumps on the pad. 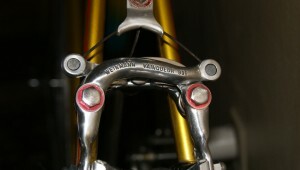 Earlier Weinmann side pull brakes of the 1930-40s had longer pads than of this time period. Lyotard Berthet platform pedals were one of the excellent brands used by many racers, durable and comfortable and topped off with Christophe toeclips, the king of toeclips. 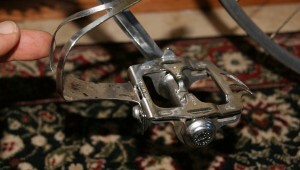 Add a set of toe straps, cinch them down and off you go. Crank set on this frame is a Durax fluted crank set mated with a Stronglight bottom bracket and spindle. 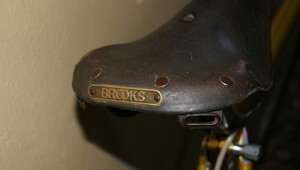 Two major suppliers of saddles were Brooks and Ideale. 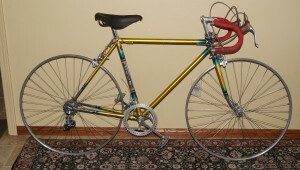 Shown here is a Brooks B15 saddle with the brass badge rivited to the rear. Leather saddle required care during break in, some polishing upkeep but riders were rewarded with a very comfortable saddle that molded to the rider. This model has the saddle bag loops as part of the cantle frame. Stronglight Headset with the serrated tooth locking washer and V channeled races are a very durable headset with excellent quality steel. 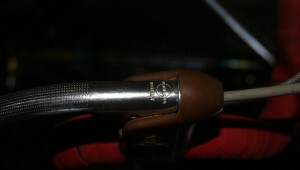 The Nervex Professional lug set was the most popular lug set of its time. Campagnolo handlebar end shifters were also very common during this period of time on the Swiss bikes as Italy was just a stones throw away and Campagnolo was the giant of racing. Here is a 1950’s Cilo Track bike from the golden era of Swiss bicycle manufacturing. This Page is under construction, any information is appreciated.